This state-of-the-art solution provides high level security and increased performance to websites of all sizes. Through a simple DNS change, your website's traffic is seamlessly routed through a globally-distributed network of high-powered servers. Incoming traffic is intelligently profiled in real-time, blocking even the latest web threats: from sophisticated SQL injection attacks to scrapers, malicious bots, intruding comment spammers and thwarting multi-Gigabit DDoS attacks. Meanwhile, outgoing traffic is accelerated and optimized with a global CDN, for faster load times, keeping welcome visitors speeding through. Regardless of website platform, your website can be under this advanced protection in under one hour by a simple DNS change to route the traffic through our sophisticated worldwide network. There is no hardware or software to install or maintain and you can keep your current hosting provider. Changed your mind?, no problems the service can be turned off any time as easily as it was turned on. 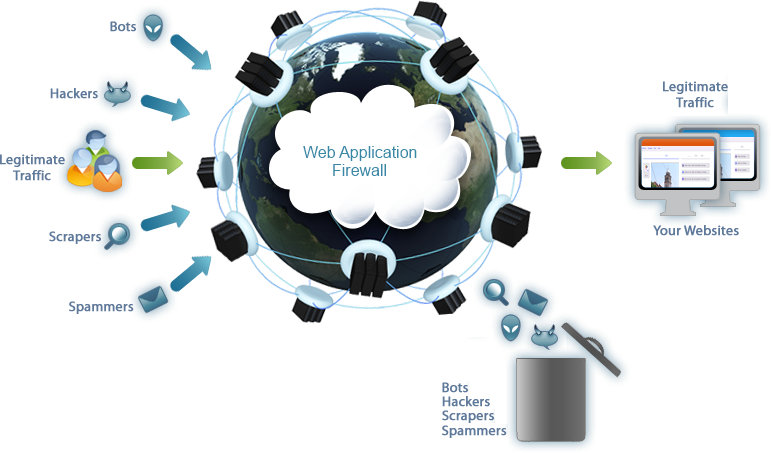 Using advanced client classification, crowdsourcing and reputation-based techniques, your web application firewall distinguishes between "good" and "bad" bot traffic. This lets you block comment spammers, scrapers and other types of malicious bots, as well as inspecting other suspicious visitors. Comprising a global distributed worldwide, your Content Delivery Network (CDN) boosts website performance via advanced caching and optimization techniques. Websites are, on average, 40% faster and consume 50% less bandwidth using this service. Using innovative traffic analysis techniques developed for our security services, the CDN maximizes cacheable content to accelerate page load times while ensuring visitors always get fresh and accurate content. Real-Time Monitoring is a powerful website management tool which displays live views of incoming traffic, security events and server activity. By providing access to live actionable information. Real-Time Monitoring enables instant data-driven response to any unwanted scenarios. Implement strong two-factor authentication on any website or application without integration, coding or software changes. Single-click activation lets you protect administrative access, secure remote access to corporate web applications, and restrict access to a particular webpage. Manage and control multiple logins across several websites in a centralized manner. This enterprise-grade PCI-certified Web Application Firewall (WAF) ensures that your website or application is always secure and available. Based on Imperva's industry-leading technology and experience, the cloud-based WAF defends against OWASP top threats, as: SQL injection, cross site scripting, illegal resource access and remote file inclusion. We offer a Level 1 PCI-certified service that includes on-demand compliance reporting directly from the application dashboard. These reports can be presented to PCI auditors to demonstrate your complete compliance with the terms of PCI requirement 6.6. Hackers covertly install malicious code (known as a backdoor) on your website that gives them full access to your application and data. An adaptive security engine and WAF monitor website traffic to prevent backdoor install attempts and to quarantine backdoors already installed, rendering them useless. Protect your website against all types of network-level (Layer 3 & 4) DDoS attacks, such as SYN or UDP floods. With 300+ Gbps network capacity, The service is built to handle any attack that comes your way. Our service automatically and transparently mitigates DDoS attacks, while continuing to support an excellent user experience through our global CDN. Protects your website against all types of application-level (Layer 7) DDoS attacks, such as Slowloris and request floods, that attempt to overwhelm server resources. With 300+ Gbps network capacity, built to handle application-level DDoS attacks of any type. Automatic detection and triggering enables "always on" DDoS mitigation, enabling you to handle smaller scale "hit and run" application-level attacks consisting of short bursts of traffic in random intervals over a long period of time. This automated feature takes full responsibility for both detection and mitigation of DDoS attacks. The service fully supports websites with EV (Extended Validation) certification and other custom SSL options. Our dedicated product and security experts will work with you on complex setup, integration and customization requirements to ensure your security and operational goals are met.